10 year US bond yields have broken through key resistance confirming a large double bottom reversal pattern, according to David Sneddon and James Gilbert at Credit Suisse in London. 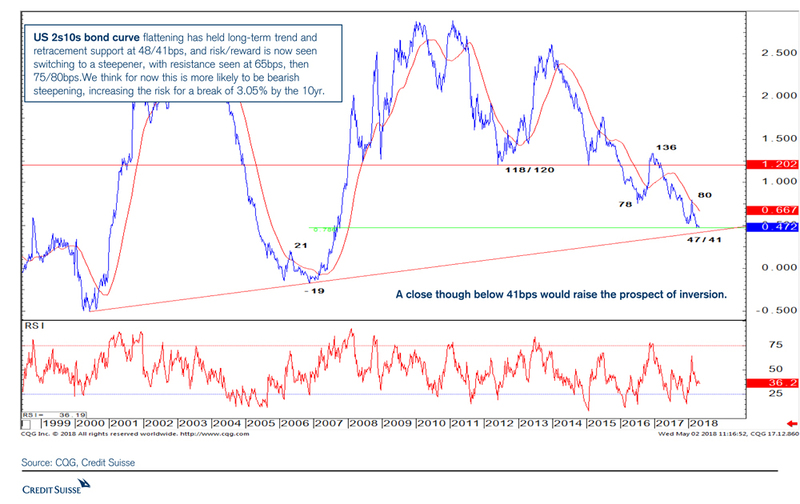 Sneddon and Gilbert say that 10 year US bond yields have already broken their secular downtrend from the late 1980s and have now broken through a critical level at 3.05%, the high of 2013 (see Chart 1). This marks a multi-year “double bottom” reversal pattern and a bear market for bonds, with the next major level seen at around 3.30%. Such a pattern, they say, would typically warn of much higher bond yields to come that will eventually hurt the equity market. 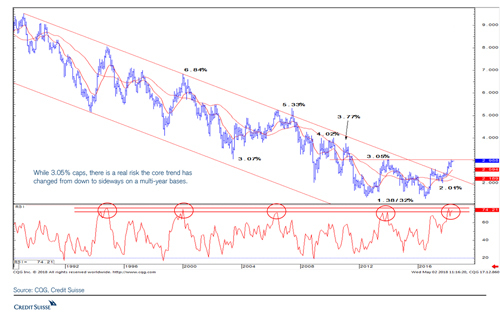 In terms of real yields, which Sneddon and Gilbert see as more important for equity markets, they think the move of the 10 year US Real Yield through 0.82% (the high of 2016) is sufficient to confirm its 5-year range has been resolved higher, with support seen at 0.93%, then 1.10%, and likely higher (see Chart 2). 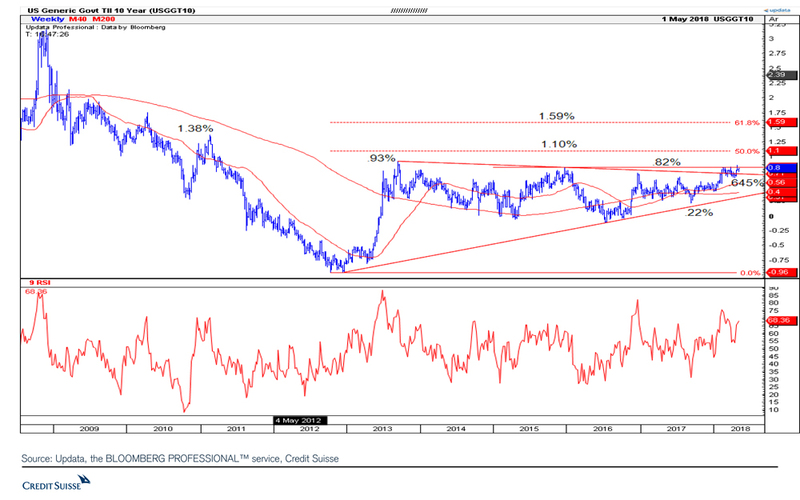 The Credit Suisse Global Equity strategy team highlight 1.25% as a key level for equities. Overall, Sneddon and Gilbert expect the yield curve to steepen, ending a long-term flattening trend. They point to the US 2s10s which has fallen to what they see as a key area of support and a level from which they expect it to rally (see Chart 3). See Chart 1 (10 Year US Yield), Chart 2 (10 Year US Real Yield) and Chart 3 (US 2s10s bond curve).